Exactly one year ago we launched the Ewafe project, with the aim of providing a loving home for the many children who are so sadly abandoned every year in Kampala’s slums. And we can’t believe that our vision is soon becoming a reality. Last month we held our fantastic “Raising the Roof” fundraising gig hosted by Michael Kiwanuka, which raised an incredible £11,500! And just one month later we are incredibly happy to announce that we have indeed managed to “raise the roof” on our abandoned children’s home because of the success of this event. 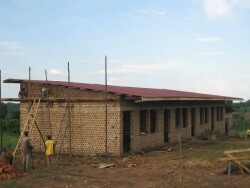 The main structure of the roof is now complete and due to the amount of donations we received we have also been able to put in windows and doors. It is also amazing to think that just 6 months ago the site was just a bare piece of scrub land, and now we have a building that is almost ready for the children to move in! This home will house children who have been abandoned and urgently need a place to stay while we either trace their families or look for suitable foster families to place them in. 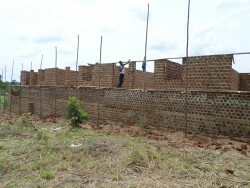 The next stage is plastering the walls and painting the windows and doors which is due to start next week. After that we are hoping to be able to put in latrines, install electricity and purchase furniture for the home and beds for the children. We are also looking for supporters and friends to help towards the general running costs of the home once it is completed. We are extremely grateful to all those who have donated and fundraised for this project since it launched in June 2013; we have been overwhelmed with the generous support we have received from so many people, and we would like to say a huge thank you. For more information about the Ewafe project, view our Ewafe project video and if you are interested in donating or getting involved in any way, please click here.